CentreStack for Service Providers is a completely on-premise, multi-tenant sync and share platform that works with local storage or private cloud storage. It brings recurring revenue stream for service provider, while at the same time, enhance the service providers' value-add for the storage services they are managing. Simple Setup Process – CentreStack provides a Windows Installer package that creates file sync and share solution based on Microsoft web platform. It’s easy to install, manage, and scale. OpenStack, DFS and More – CentreStack works with everything from file server storage to NAS, DFS, SAN storage as UNC path. It also supports private EMC Atmos, OpenStack Swift storage services, or even public cloud storage services. Billing – Purchase licenses in bulk from the CentreStack partner portal which allows independent assignment to your users so you can bill them directly. Independent Tenants – Each tenant is a private management scope with its own storage and identity management. Single Server Scalability – CentreStack servers are very scalable and can support more than 8,000 users per server. The solution is easily scaled by adding servers. High Availability – Typical multi-site deployments replicate SQL Servers and private storage across locations with global load balancing across the CentreStack servers (worker nodes). Self Service Branding – Use the management console to rebrand the web interfaces and desktop clients with your own logos and images at no additional cost. Full Service Branding – Includes the ability to rebrand the mobile clients and the file server agent. Customization – The CentreStack platform can be further customized to meet your needs. Contact us for more information. The solution runs inside your own infrastructure. You have 100% of the control of the data storage. You decide how to secure data path for the peace of mind. The solution integrates natively with your file server and your customer's network shares and preserve NTFS permission all the way to file level. Since the solution itself is based on Windows Web Platform, access check is done natively within all the Windows components. You can customize the web portal and access components from Windows client to Mac client. You can even transform iOS and Android client to your own name and sign with your own certificate for Apple AppStore and Android Marketplace. There is also per-tenant level branding available. You can integrate Active Directory natively as the center piece of user identity management. No duplication of user identity, nor does merging identity required, the Active Directory is the only place to manage users. Each tenant can connect to its own Active Directory independently from other tenants. Team folders with version control and file locking make it ideal for team collaboration. Team folder can also be converted directly from existing network share, with all the existing Active Directory identity preserved. Team folder has flexible permission control on top of existing NTFS permission control. The solution is enterprise ready. Companies as big as having 250K+ employees are using the solution to allow employees to access, share, sync company files and documents, while maintain security and control under the company's IT department. It has multiple group policy items to control file and folder sharing behavior. The solution is based on a real drive letter in Windows Explorer and a real volume in Mac Finder. 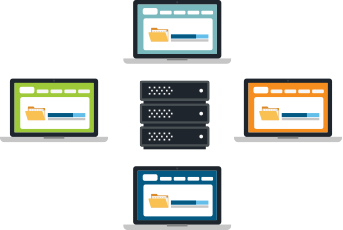 It enables on-demand synchronization that is a good fit for big folder and VDI type of environment, in addition to save bandwidth for regular usage. When customer's file server is away from your IT infrastructure, the CentreStack file server agent can be used to synchronize the file server folder content over to the CentreStack server side. This feature can help customers backup their file server and continue to use their file server in the case of disaster recovery. Simple, Powerful administration web portal for manage users, policies, devices and team collaboration. In addition to web portal, there is also PowerShell and LabTech plugin integration to ease the management work and provide capability to plugin into service provider's existing management framework. To make it even easier for administration. There is delegate administration and role management to have more users help out the management in a controlled way. The web portal file manager is designed for both desktop computing and mobile computing. Native mobile clients include those for iOS, Android, Windows Phone and BlackBerry. Supports most desktop and mobile platforms such as Windows, Mac, iOS and Android. Check out our unique file server agent feature that bridges remote file server such as Windows 2003, 2008 to 2012 to the central file sync and share solution.